As the last days of summer wind down and the weather begins to change, so does your skin. Cooler, dryer air means your beauty regiment needs a revamp to keep your skin moisturized and healthy. With the air getting cooler and dryer, your skin starts to feel the effects of the season. Using the right moisturizer can help your skin develop a lipid shield, which in turn helps maintain the natural oil and moisture of your skin. As fall settles in, switch to a heavier cream or lotion-based moisturizer for your face and skin. 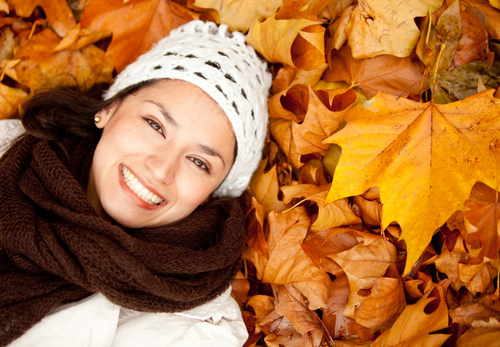 When temperatures drop, use your moisturizer twice a day to combat the dryness of autumn. If you were using a heavy-duty cleanser during the hot, humid summer months, this product might dry out your skin as the season changes. For the fall, try a non-drying, sulfate-free gel cleanser in the morning and a lightweight, lotion-based cleanser at night. This duo will help clean deep into pores and remove dirt and makeup without zapping moisture from your skin. Just because the weather is getting cooler doesn’t mean you should neglect using sunscreen. The sun’s rays can damage your skin year-round, so you'll want to protect your skin with a moisturizer that includes SPF. SPF protection helps ward off wrinkles and sunspots, which in turn helps keep your skin looking healthy youthful. Not to mention protecting you from skin cancer! Exfoliating dead skin even a few times a week will help your skin retain moisture as the air gets crisper and dryer. Plus, removing dead skin will make your moisturizer even more effective. Use an exfoliating scrub, exfoliating gloves or a dry brush in the shower to help keep your skin smooth and glowing for those trips to the pumpkin patch.